When you winter in a place such as Naples for eight weeks, it’s not a vacation – it’s a relocation. For 20 years, one fantastic week at a time, I have vacationed in Naples. Over the years, my family and I had fine-tuned each visit to our sunny paradise. It was a surgical strike at the best of what the area could offer, with our routine down pat. Arrive at Southwest Florida International Airport and scoot past the grandmas and grandpas greeting grandkids before acknowledging the existence of their own children. Exit and inhale the warm, humid Floridian air, say in union, “I am so happy to be here,” and then set off for seven days of dining out, sightseeing and all-you-can-eat fresh citrus. We would ride the leisurely tram to Clam Pass beach, take advantage of early-bird specials on pricey 5th Avenue, feast on fish and chips at low-key Pinchers and – quite possibly my favourite thing to do – stroll the four-kilometre boardwalk through Corkscrew Swamp Sanctuary, North America’s largest old-growth cypress forest. And, always, at the end of each week, we realized that it hadn’t been nearly enough time. It only stood to reason then that when I retired, we would go for longer. We were so excited about this new opportunity last winter that we invited lots of friends and family to come stay with us so we could share all of our beloved experiences. Eight weeks of the same stuff, I assumed, would be eight times as fantastic. Corkscrew Swamp Sanctuary is North America’s largest old-growth cypress forest. After just three visits, I didn’t want to go back to the Corkscrew Swamp Sanctuary. It got so bad that when the possibility of taking another group of guests arose, I sulked. I couldn’t be bothered to leave the beach. We didn’t eat on 5th Avenue every week, and only went to Pinchers once during our entire stay. I brought my golf clubs all the way from Toronto in a car that couldn’t afford the room and I never played. Not once. And yet … I had a fantastic time. In the mornings, I liked going for a run, especially since down there it’s warm and I am taller and faster than most of the people around me – which is funny because I’m not fast at all, nor am I tall. I loved coming back to our condo to have breakfast and coffee with my wife while gazing at the Gulf of Mexico, looking for dolphins. I found pleasure in walking for hours with her on the beach and collecting shells. I started to pay attention to the tides, so I’d know when it would be easier to swim to the sand bar just off shore to collect sand dollars. I became acutely aware of the bright, neon colours of the flowers, houses and even clothing, compared with the selection of greys we’d left behind in Canada. I started to wonder why I’d never heard a pelican call. They are so big and graceful, which I like, but even better, they are quiet, unlike those noisy seagulls, which I can’t stand. The beaches in Naples are among the nicest in the United States. I grew accustomed to spending the morning outside “piddl’n'" – a term one of the old locals used that means “fussing without doing much of anything.” In the afternoon, we’d spend a little time on the beach, doing absolutely nothing and appreciating every moment. Sometimes we’d bring drinks and snacks and, occasionally, a cigar for me. We’d read books and I’d gaze off into the distance, totally at peace with my thoughts. If we felt like it, we’d leave the beach early and go for groceries. But we didn’t always go to the gourmet grocery shop we visited while on vacation because it was super expensive, which is okay once a year, but not for weeks on end. And it didn’t have a lot of the basics. So we went to Publix a lot, and guess what? I don’t like getting groceries in Naples any more than I like getting groceries in Toronto. People in Naples display the same poor shopping-cart etiquette and selection indecision as people back home. Naples has the second-highest proportion of millionaires per capita in the country. Most of the beaches in Naples have fine white sand, a gradual entry into the warm Gulf waters and lots of shells to collect. Posh 5th Avenue, with its high-end shops and fantastic restaurants, hasn’t missed a beat and is busier than ever. Jon Kabat-Zinn, the old Zen master, said, “Everywhere you go, there you are.” He was right. Why would I like grocery shopping just because we were down south? And, at home, I am not fanatical about golf, so why did I think I would make friends playing three times a week when I got to Naples? I also brought my ukulele. I thought that with all that time on my hands, I’d soon be playing concerts. The reality is, up to that point, it had taken me three years to learn the Beatles classic Let It Be and parts of two other songs. Why did I think all of a sudden I would start practicing 24/7? Yes, everywhere I turned, there I was. The same guy who lives in Canada and doesn’t golf all the time, or practise ukulele with regularity, or like crowds or guests that hang around too long. Yes, although I love my family and friends dearly, when they came to visit, it was quickly apparent that they were on a vacation while we were on a relocation. Big difference. They wanted to get up and do things – often things we’d already done. And some of them wanted to be served, which is okay if you’re coming to my house for dinner and then leaving before bed time, but not for days on end. That’s a lot of meals and many cocktail hours. I loved being in Naples with my wife for eight weeks because it was warm while Toronto was really, really cold. I loved the little life we made there. I loved being so tired from a day in the sun, we’d go to bed at 9:30 p.m. and we didn’t care because there were no big-city distractions to make us feel like we should stay up later. I loved taking the time to listen to waves gently wash over seashells. I learned that the beach is changing constantly, which was a huge surprise because it never seemed to change in 20 years of visits. But when you watch it every day, you notice things. The colour of the water changes. The slope and shape of sand banks change. As do the types of fish that swim by and the kinds of shells that settle on the shore. It’s interesting and dynamic and not at all what I expected. Much like the snowbird life. Going to bed early and listening to waves gently wash over seashells is a welcome change from cold, busy city life in Toronto. Naples, located on Florida’s Gulf Coast, is rich: It has the second-highest proportion of millionaires per capita in the United States. After hurricane Irma passed, the city had lots of cash to clean up, and they did just that, almost before the next private jet could arrive to assess the damage. Today, you’d never know a hurricane blew through. Posh 5th Avenue with its high-end shops and fantastic restaurants hasn’t missed a beat and is busier than ever. Ferraris compete with McLarens for parking spots and expensive cigars are the playthings of the wealthy. How you choose to spend your money will likely depend on how long you’re sticking around. If you are determined to see alligators, head to the Audubon Society’s Corkscrew Swamp Sanctuary later in the day when they sun themselves in plain sight. Its four-kilometre boardwalk is magical. We’ve seen lots of alligators and snakes – including the deadly water moccasin (a.k.a. cotton mouth) – and so many types of rare birds, snails, frogs and plants I’ve lost count. It’s never overcrowded, with an average of 150 people passing through every day. My favourite time to go is at opening, when the light is low, it’s quiet and, dare I say, “spiritual”? The beaches in Naples are among the nicest in the United States. Most have fine white sand, a gradual entry into the warm Gulf waters and lots of shells to collect. You can often see dolphins close to the shore. We love the Clam Pass Beach, in large part because of the tram ride from the public parking lot, through the mangroves to the café that sits atop a pier at the beach entrance. Lowdermilk Beach is another fine one. It has a significantly larger parking lot than most in the area, but be warned: a bigger lot does mean bigger crowds. Most restaurants in Naples are good, one standout on 5th Avenue is the French Brasserie Rustique. It’s on the pricey side, but if you eat in Naples at 5:45-ish, just before the early bird dinner ends, you get the same food as people who eat at 6:00 pm, but for less money. Book a spot on the patio well in advance. On the lower end, our family tradition starts with a visit to Tin City and a family restaurant called Pinchers for fish and chips. Tin City is kitschy – a collection of T-shirt shops and stalls selling souvenir coconuts painted in the colors and logos of NFL teams. But it is classic Florida. Our first “must do” is only 15 minutes from the airport. The Sun Harvest Citrus Factory is tourist trap, but we love it. Grab a bag of in-season oranges, a bag of grapefruit, a jug or two of fresh squeezed goodness and an orange-vanilla swirl, soft-serve ice-cream to go. My favorite cigars come from my favorite cigar lounge, Freedom Fine Cigars. Try their great-quality, but inexpensive house-brand cigars while stopping by for friendly chat, live music and a glass of beer or wine. Ask for Randall, he knows his stuff. If you drive south, Along Interstate-75 by Dave Hunter is an amazing read. Not only does it provide tips on the best places to stay, but also road construction areas, which are updated online. And it seems to know where every speed trap is for the 24-hour journey from Detroit. 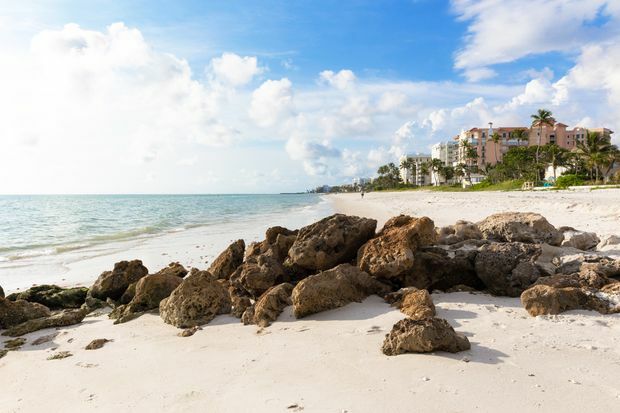 It is extremely difficult to find a beachfront condo in Naples for less than three months. We were fortunate that we found a last-minute opportunity. To find rentals try homeaway.com and vrbo.com. You can join Naples' Collier County Library on a monthly basis for US$10. If you want to stay in for dinner but still treat yourself, the Fresh Market, a specialty grocery store, has an amazing selection of excellent gourmet food. For day-to-day groceries, head to the Publix. 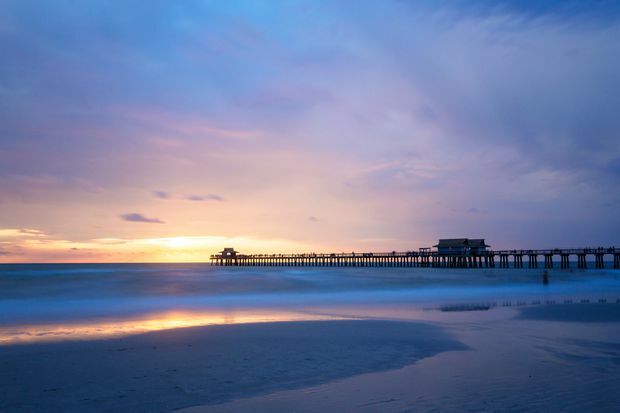 Why is Florida so chilled out, anyway? Why see the best of Florida when you can see the weirdest?